Last week’s Doucet-does-Cubism ensemble brought a resounding affirmation of Doucet’s ability to adapt to the post-Edwardian fashion world. The only major quibbles were whether the cape and beading added or detracted from the outfit. Some of you were extremely pro cape, and thought it made the outfit. Some of you were…not. Same thing with the beading. The Total: 9.7 out of 10! No wonder so many of you have added it to your sewing inspiration list! Muelle designed costumes for the Paris Opera, so it’s possible that this dress was a stage costume – though costumers also designed clothes, and major stars went to known couturiers (including last week’s Doucet, who designed for the Divine Sarah, among others) for their stage and everyday clothes. 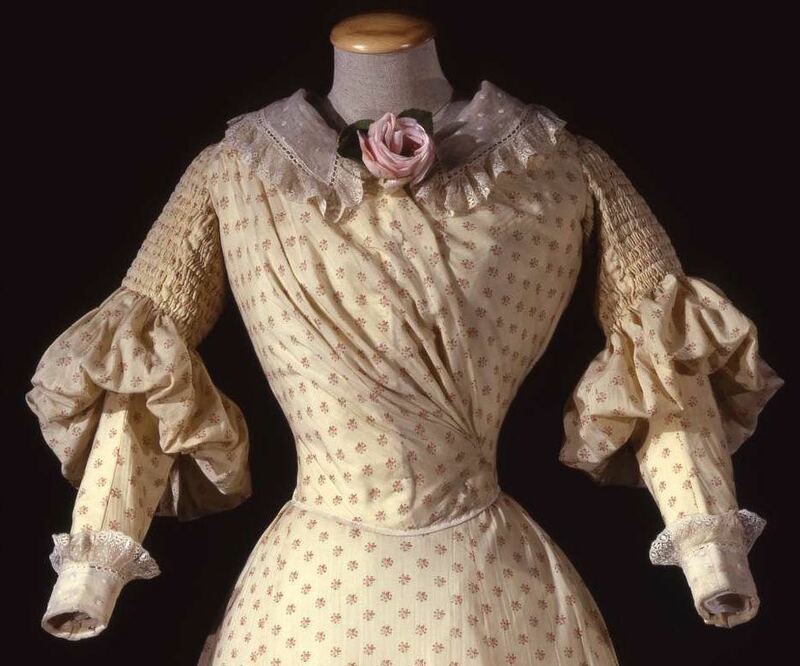 The dress, with asymmetrical draping pulled over a very fitted bodice, A-line skirt, and smocked sleeves, combines typical elements of 1890s fashion. Combined with the light floral fabric and lace cuffs and collar (and flower, which may be a museum addition), the overall effect is very feminine. What do you think? Is this a dress for a sweet young ingenue onstage, or a diva on her day off? Or is it too boring for either? You know, I don’t really like it all that much. The twee print, plus the collar and the rose, plus the shirring + puffs, plus the ruffle along the bottom–it’s just all a bit blah without a cheeky detail to make it youthful and charming. I do like the print and the draping on the bodice, and if the rest of the shape had been equally sophisticated I’d enjoy it. However. This is pretty much exactly what I would dream up at age nine for “pretty pioneer clothes” (Laura Ingalls was earlier but shhh I was nine), so in honour of my younger self I’ll give it an extra point and a half. It’s *very* feminine. Almost excessively so. I like the fabric rose on the bodice, the print, and the fitting of the bodice. But I’m no fan of the sleeve puffs, the various ruffles, and the odd way the lace lies at the bottom of the cuffs. No diva would wear this, in my opinion; it’s too structured to be a dress one wears when one is alone, without pretense, and it’s too sweet and innocent to appeal to a diva for public wear. I’m biased by the fact that I don’t like ruffles, or insipid sweetness, but the features of this one are sufficiently well-done that it deserves a serious response. Hmmm… no. It is just too many details I am not fond of. And the bottom of the skirt looks like something that would suit a piece of furniture. I love this dress. I feel that the simplicity and elegance of the wrapped bodice are well balanced by the smocking and puffs of the sleeves. I like the lace cuffs and collar as well as the rose, since it is in a museum and you can’t have a real fresh rose, which would be ideal. Unlike most millenials, I love me some ruffles and “prairie” prints; having grown up in the 60’s and 70’s. It actually bears some similarities to a couple of my prom dresses. I think it just seems stiff because of age and it is on a manikin. When new, I bet it had a softer hand and draped sweetly. I would love to have this dress. I give it a resounding 10! I love the shape, the rose, sleeve puffs, and lace not so much. There should be a semi colon after shape, which is lovely. All the rest are detractors. It’s a sweetly impractical upper class day dress, modest design, but clearly expensive and on trend. If you wanted to signal “well brought up in a conservative family, and the dowry will be adequate”, this dress would do it. The only detail that really bothers me are those elbow poufs. I wonder if the shirring on the sleeves was to collapse a suddenly unfashionable leg of mutton down to lambchop size and they had to leave the poufs so she could sip tea. I’ve never encountered a wool muslin before and it sounds like a wonderful fabric. So light but also moldable, and enough body for the sleeve puffs. If it were a stage costume I’d put it on an 1890s Marguerite in Faust, but I’d switch the collar rose for a real flower for her to hold. I give it a 9. It’s lovely and feminine. It would be fun to wear. I’m not a fan of the puffs on the sleeves. A bell shaped sleeve with the smocking on top to control the fullness without that pillowy puff would have better lines. Of course I am not a lover of big sleeves as I always look like a Back end for the Green Bay Packers standing in a pot hole when I wear them. Love the bodice, hate the sleeves! I love the subtle drama of the bodice draping and the shape of the skirt. Do not care for the sleeves, which seem to be assemblages of mismatched elements. The colorway is a bit nondescript, but inoffensive, and I’m indifferent to the rose. Pretty and femme, if a bit bland. Which isn’t to say I don’t like it; only that perhaps it could use a bit of brighter or more intense color (I’m kind of picturing a dark burgundy-ish red, with a bit of a rustier tinge if that makes sense) or something. And I think maybe wide tucks would’ve worked better at the hem. However, the fabric itself is lovely, and I want approximately 100 yards of it for myself. My other thought is: maybe this really was meant as a costume. After all, lots of historic historical costumes take the general silhouette of period in which they were made, combined with iconic details from the period they’re supposed to represent. Those sleeves and collar definitely could be interpretations of late 1820’s-1830’s styles. I like the bodice & sleeves, and I like the overall shape, but I’m not sold on the skirt ruffle (as someone put it above, “not sophisticated enough”), and I’m not sold on the colour (having a hard time picturing anyone on whom it would not be bland), and not quite on the collar, either. P.S. But I’m thinking my failure of imagination is also because it’s early in the morning, the only time I have to myself and the internet on a busy day; so that doesn’t play a big role in the rating. I really like the sleeves, and the bodice is super cool! The overall aesthetic I love, because individually I like the intricate sleeves and complex assymetry. I like the fabric, I know some people don’t love neutrals because they’re boring, but let’s be honest – more people nowadays wear black, beige and gray without any other color whatsoever. “Because it goes with everything!” So I won’t critisize a gown for it’s lack of color. Ultimately, though, the sleeves are out of place. They are too 1830’s-ish…by the 1890’s, it might have been “kind of retro”, which I suppose is the whole point of the 1890’s puffed sleeve, but to go the point of skipping the puffed part and going for the saggy bicep seems like a grandma was making a dress for her granddaughter, and got so swept up in the nostalgia she did the completely wrong kind of sleeve! Also the flower is a complete no-go. It’s like an object that wants to be your second chin. The ruffle at the bottom is….not out of place exactly, but it’s too sweet. I think I would have made it a larger statement ruffle. I love the feminine details, the shape, the wrap bodice. The bodice fashioned that way, that seems a progressive design for the time? Not sure about that. I give this dress a 9. I’m not that fond of the dress, although I think that’s partly due to my modern sensibilities not really picking up on the fashion of the time. But I just – ehhh. This is a very sweet little gown (emphasis on little!). I love love love the sleeves and the skirt is very simple and balances the busyness. I also think the draping is well done and the collar and flower a good fit BUT I think the balance of the bodice is wrong. I feel like the draping would work better if it was a little lower, and had the flower halfway between neck and bosom, with the collar appropriately lower and along the sides. Usually I really dislike the 1890s, my least favorite decade of the Victorian era. But I find the bodice and sleeves lovely. 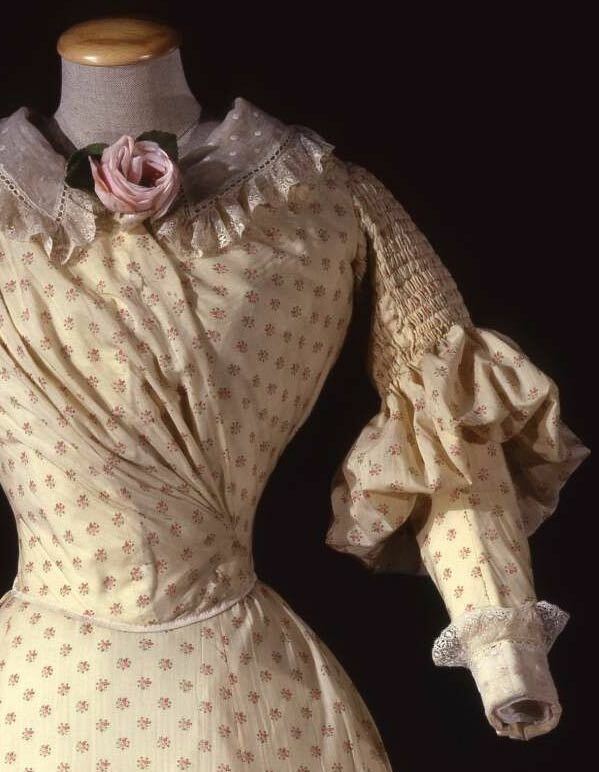 It’s interesting how reminiscent the sleeves are to styles of the 1840s. The wrap bodice as well, come to think of it. 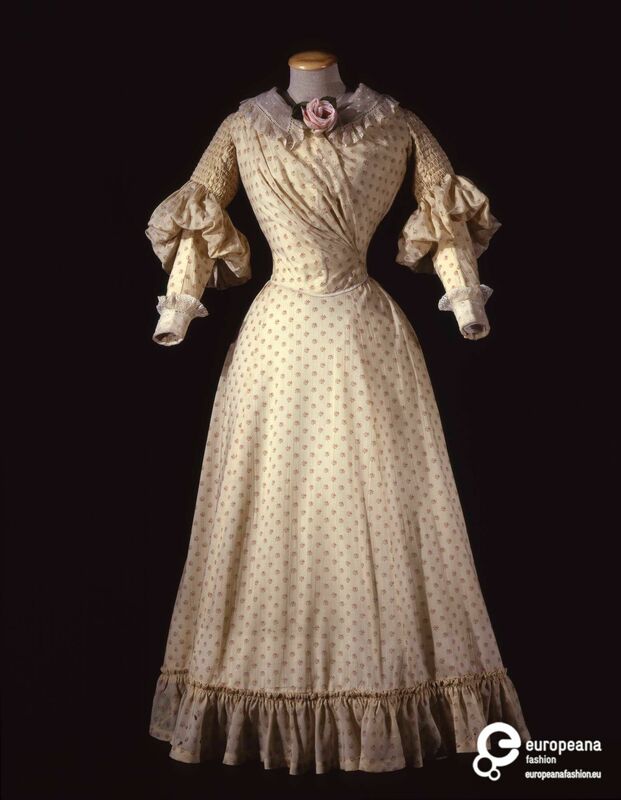 But I’m wondering if c. 1893 is the correct date for this dress. Sleeves typically had more volume at the shoulder to upper arm at that time, and were generally much more voluminous. The sleeves on this dress seem very tight on the upper arm, with the puff being on the elbow. Maybe it’s from later in the 1890s, after sleeves had begun to deflate? Though the wrap bodice is a style I associate with the early ‘90s. Honestly the sleeves seem unusual for any year in the 1890s to me. I’ll have to check and see if I can find anything similar in fashion plates from that era. The only thing that really doesn’t work for me is the skirt. The hem ruffle is the worst offender. It spoils the elegant look the dress could have had. This needs a plain, unadorned hem. Second is the skirt shape. The hemline is too wide. 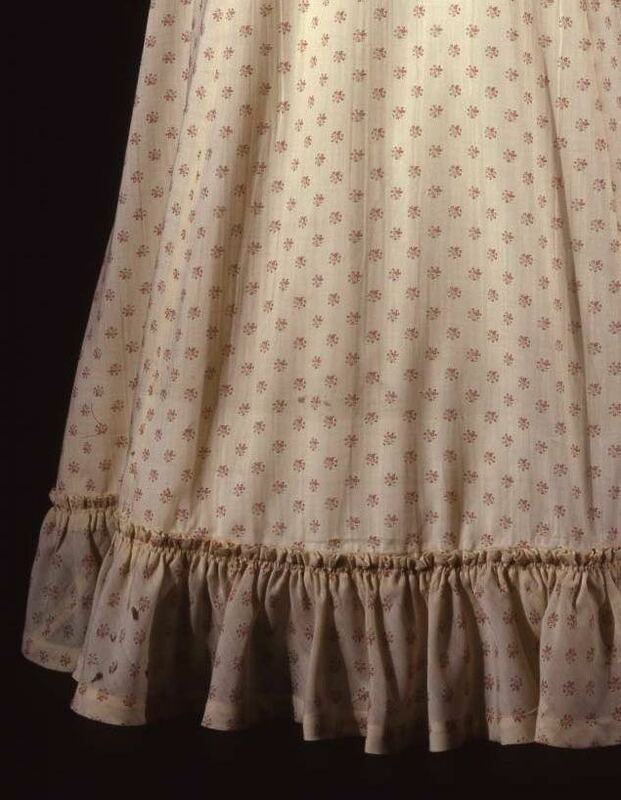 The petticoats the museum presumable has under the dress make the skirt stick out stiffly, which doesn’t help. What I would really like is the more flowing skirt shape of the Edwardian era. With a plain skirt in a flowy, Edwardian trumpet shape, this dress would get a 9 from me. As is I’ll give it an 8. Oh and one last thought. I could really do without the lace at the cuffs. I gasped audibly when I first saw it, but then I had conflicting emotions about the upper sleeves a I don’t like it so much but they were similar in the early Victorian era (which I thought it was from at first glance), so overall it’s kind of a hybrid between my favourite eras… I wanna give it 9.9/10 but if I can’t it has to be 9.5. Its biggest flaw is it isn’t in my wardrobe! Wool muslin!! It’s glorious! It sits so beautifully. But I feel like I am looking at two dresses – one that is relentlessly symmetrical in its sleeves and collar, sweet and innocent. And another that is sophisticated with the dramatic swoop of ruching on the bodice, the fitted bodice and gorgeous skirt shape. I did put my thumb over the collar rose and preferred it without as it just emphasises the strange marriage of styles. So what to do. I think it would be better if it went one way or the other and as such feels like a compromise. Yet I really like all the bits! It looks like an 1890s costume for a play set in the 1840s. I make a bold guess and say it would be perfect for „Camille“ evoking the scenes when Margeruerite and Armand have their sejour in the country. If the flower was a Camellia instead of a rose I‘d be rather positive about this. The harmlessly rural fabric and the prim yet sweet collar plus that single modest ruffle at the hem almost look like a stereotype: The dream of the simple life by any romantic boarding school girl ca 1893 .To make it short: it looks like a costume to me so judged as a regularly worn dress this would have come off as too oldfashioned and gimmicky in 1893.It‘s still rather easy on the eye so that saves it a little. 6 . I LOVE this dress! I would love to make one just like it. Between the sleeve and bodice details and the beautiful, yet simple, fabric, it is so gorgeous. I give it a 10. Oklahoma! Where the wind comes sweepin’ down the plain! Seriously this looks like one of Laurie’s dresses! I think the sleeves would be less annoying if the puffs were larger. Also,didn’t someone say tucks might be better than a ruffle at the hem? There are a number of elements here that I like. The fabric, the skirt, the decorative rose and the draped bodice all appeal to me. However, as a whole this dress doesn’t do much for me, and I really dislike the sleeves. I think Tsu Dho Nimh has it right, this dress signals a well brought up young lady from a well-to-do, respectable family. But I wouldn’t necessarily expect a very open minded young lady. The overall effect is too conservative for me. Excellent construction. Very precise. Ingenue. Almost too literally ingenue. Feels like whoever designed this knew EXACTLY who would wear it, what we were expected to think of them, just like a costume. It doesn’t feel like a dress designed to be worn, but a dress that was intended to broadcast sweet prettiness and demure submissiveness to the back row of the rival theatre in the next city. And yes, I think it’s from a historical play, it’s just not really “fashion” for any period apart from the overall silhouette, especially with those very literal Earliest-Victorian sleeves, super slopey constrained smocked shoulderline and faintly dorky (in this context) little collar and cuffs. I do love how the lantern puffs sit into the curve of the corseted waist.